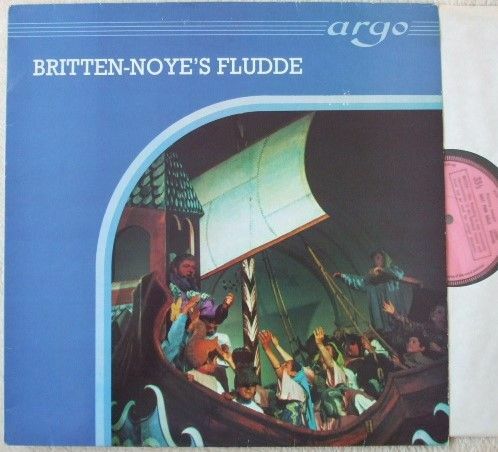 33rpm LP Record of ZK 1 BENJAMIN BRITTEN NOYE'S FLUDDE (The Chester Miracle Play), featuring Owen Brannigan (Noye), Sheila Rex (Mrs Noye) and Trevor Anthony (voice of God), accompanied by the English Chamber Orchestra, a Chorus of Animals and an East Suffolk Children's Orchestra. Conductor Norman Del Mar. It was issued on the Stereo ARGO black and silver box label in 1961. Pink label test pressing (factory sample). Libretto included. TAS listed. The record itself is graded a bit less than excellent, with one or two light surface marks when viewed under normal house lighting. Play-tested on a USB turntable. Superb sound quality, with NO jumps, repetitive ticks or crackle and just a few isolated pops. Otherwise more or less faultless playback. Minimal to no spindle wear. Labels clean. Very faint spider marks. The outer sleeve is graded very good with just a little light wear (bumping to corners, a little creasing here and there, light sticker removal residue to front cover). The spine is intact and strong with no loss to the lettering. The inner sleeve and insert have no wear to speak of.